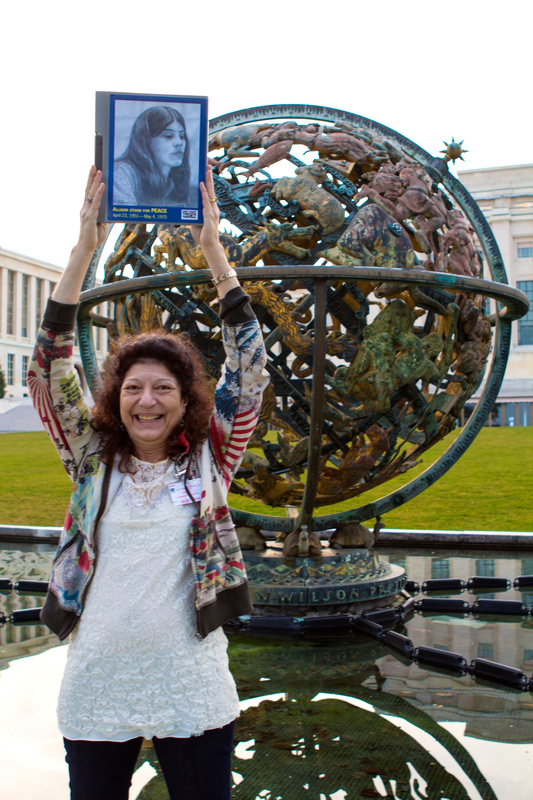 An in-depth read on current developments as the May 4, 1970 Massacre at Kent State went before the United Nations Human Rights Committee in Geneva, March 2014. Article located at pages 26-28. My sister Allison Krause was one of four students shot to death by American military personnel in the parking lot of her university campus at Kent State, Ohio on May 4, 1970 as she protested the Vietnam War. I was fifteen years old when this happened. I have come here today to ask that the United States be held accountable for failing to fully investigate this incident and its own complicity in the crimes that took place and to deliver justice to the victims and their families. Allison stood for peace and died for peace on May 4th. My mother Doris Krause, now 88 years old, is not able to travel due to her failing health. Even though Mom’s not here, she helped write these words and believes in them. Our sentiments are shared by family members and by many others present at Kent State at the time of the shootings, as well as concerned citizens who have also longed for accountability for the historic, and tragic, series of events at Kent State. For 44 years the United States government has refused to admit that four young students … children … were killed at Kent State. There has not been a credible, independent, impartial investigation into Kent State. No group or individual has been held accountable. Even in 2010 upon the emergence of undeniable, credible forensic evidence pointing to direct US government involvement, there has still not been a full accounting of the events on and near that day, and no remedy delivered to the victims. Because of the failure of the US government to pursue accountability and deliver redress to victims, we ask the UNHRC to press the US to initiate a new investigation of Kent State, with a particular focus on the forensic evidence that emerged in 2010. The right to assemble and protest is professed as a cherished American value and is a fundamental facet of our democracy. The Kent State precedent has cast a shadow over this democracy for over 40 years. If Kent State remains a glaring example of government impunity, it sends a message that protestors, especially young men and women, can be killed by the state for expressing their political beliefs. My sister died protesting for peace and I would like to honor her memory by ensuring that this never happens to another American protestor again. 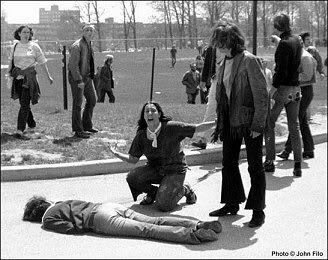 On May 4, 1970, members of the Ohio National Guard fired between 61 and 67 shots into a crowd of unarmed anti-war protestors at Kent State University in Ohio, killing four students and wounding nine others. My 19-year-old sister, Allison Krause, was one of four students shot to death by the Ohio National Guard in the parking lot of her university campus as she protested the Vietnam War. I was 15 years old at the time. But justice for Allison doesn’t have to end there. To that end, we are traveling to Geneva, Switzerland, next week to demand accountability for the Kent State massacre before the United Nations Human Rights Committee, which will be reviewing U.S. compliance with the International Covenant on Civil and Political Rights (ICCPR), one of the few human rights treaties ratified by the United States. The right to assemble and protest is a cherished American value and is a universal human right. But the United States – and so many other proclaimed democracies around the world – repeatedly and shamelessly commits gross violations of this human right. We were recently reminded of extensive U.S. government surveillance of anti-war activists in the 1960s, but sadly, such dangerous activity isn’t a thing of the distant past. As recently as 2011, with the start of the “Occupy” movement, protestors were labeled “domestic terrorists,” surveilled by the FBI, and arrested in massive numbers for nonviolent demonstrations and assemblies. The Kent State precedent has cast a shadow over our democracy for over 40 years. If Kent State remains a glaring example of government impunity, it sends a message that protestors can be killed by the state for expressing their political beliefs. This lack of accountability and hostility towards peaceful expression flies in the face not only of our Constitution, but also our international human rights commitments. 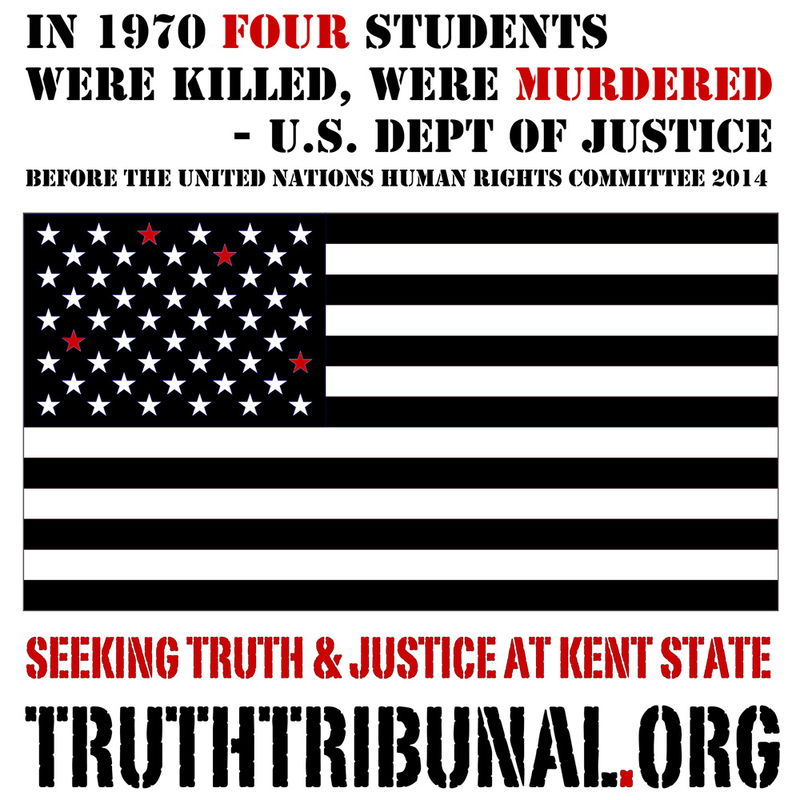 Though we are a small organization, KSTT is committed to seeking justice for the victims of the Kent State massacre. Next week, representatives from KSTT will be briefing the U.N. Human Rights Committee about the United States’ failure to provide full accountability for the Kent State massacre. We hope the Committee will ask our government to provide answers regarding its complicity in the killing of peaceful protesters, or at the very least acknowledge its failure to conduct a thorough and credible investigation. We intend to make it clear that we have not forgotten the horrific event that took place at Kent State. Allison stood for peace and died for peace. May no other protestor in the U.S. ever have to pay the price she paid for her peaceful political expression and dissent. Laurel Krause is a writer dedicated to raising awareness about ocean protection, safe renewable energy and truth at Kent State. She is the cofounder and director of the Kent State Truth Tribunal.